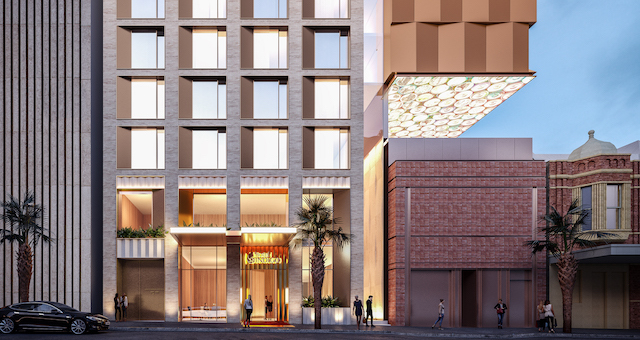 A new-build Hotel Indigo is set to open in the heart of Sydney’s CBD in 2021. Located at Sydney Central, the hotel’s design will draw on the Haymarket neighbourhood’s rich heritage. The cantilevered northern wing will provide a backdrop to its neighbour, the heritage-listed Corporation Building, while a grand artwork will become a distinctive external feature, celebrating the hotel’s location within the entertainment precinct. Inside, the design will ensure the hotel fits naturally into the neighbourhood, telling stories of the local culture by weaving together rich materials, colour palette and custom pieces from local artists, photographers and furniture makers. The 168-room hotel will have a restaurant, café and bar that will draw on distinctive local ingredients for their menus, echoing the produce markets that were located in Haymarket from the early 20th century through to the 1980s. It will also include five suites, rooftop terraces for meetings and events with views over the city, and a gymnasium. Abhijay Sandilya, IHG’s senior director, development – Australasia and South Pacific, said: “Hotel Indigo Sydney Central will be IHG’s first lifestyle-branded boutique hotel in Sydney, providing its signature ‘effortless authenticity’ to guests visiting Australia’s largest business and tourist hub. It’s also the third Hotel Indigo signing for Australia, demonstrating the appetite for a hotel that offers a local and unique experience as well as the reassurance of a global hotel chain. “We expect Hotel Indigo Sydney Central to become one of the city’s leading boutique hotels, making its mark thanks to its unique, eclectic style. It will perfectly complement our existing midscale to luxury IHG assets across this landmark city, building IHG’s scale in Australia’s largest city,” he said. Launched in 2004, Hotel Indigo is the world’s first globally branded boutique hotel brand. It launched in Asia Pacific in January 2015 with the opening of Hotel Indigo Bangkok Wireless Road, Thailand, followed by the opening of Hotel Indigo Singapore Katong, Singapore in July 2016 and then Hotel Indigo Bali Seminyak Beach in late 2017. There are currently 82 Hotel Indigo properties (10,645 rooms) in the global pipeline. IHG currently has 47 hotels operating under four brands in Australasia, including InterContinental, Crowne Plaza, Holiday Inn and Holiday Inn Express, with another 17 in the pipeline, including Hotel Indigo Brisbane Fortitude Valley and Hotel Indigo Melbourne Docklands. The new Hotel Indigo Sydney Central will be located at 15-33 Parker Street, Haymarket NSW.